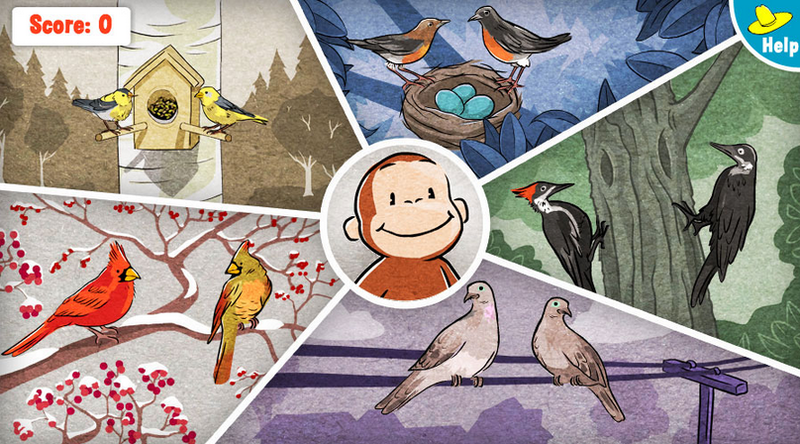 In Bird Brain – a bird themedmemory game I illustrated and designed for the Curious George website - children are prompted to remember the order of bird calls with the aid of color and short animations. The game has six colored segments, each containing a different type of bird producing a particular chirp. Each round in the game consists of the board lighting up one or more bird segments in a random order, after which kids must reproduce that order by touching or clicking the corresponding bird. As the game progresses, the number of birds to be touched increases. This online game plays on handheld and tablet mobile devices as well as standard computers with mouse and trackpad inputs. Play the game, click here.